Discussion in 'iPhone and iPad Games' started by killercow, Mar 20, 2015. 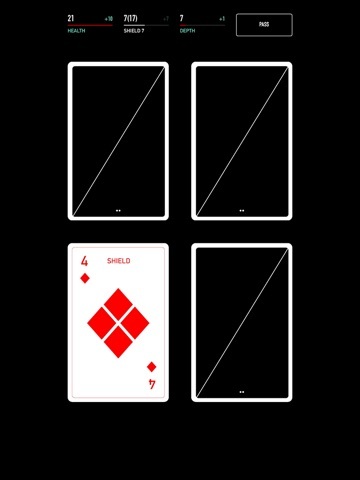 Donsol is a simple solitary card game, designed by John Eternal during Train Jam, where you must go through a series of rooms(4 cards) with the tools available. Very interested in this, has a huge amount of potential. Not sure I'll wait for impressions for this as it's quite niche. Nice find! Same guy who did Oquonie, might have to bite on this one. So far it's... very minimal. 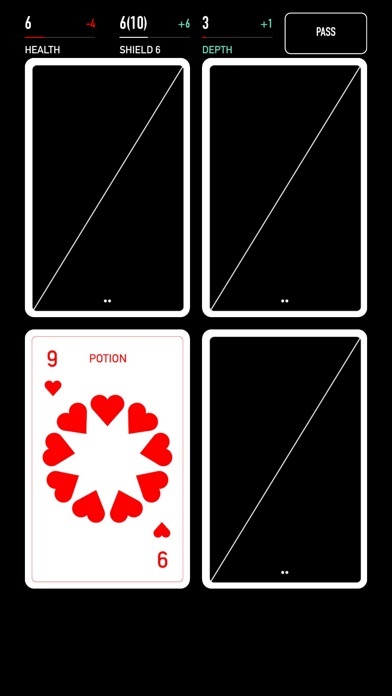 You get 4 cards, which can be potions, shields & two suits of monsters. At the top of the screen is Health Points, Armor Points and Experience Points. In the middle of the screen is a dot that you can expand (and sometimes auto-expands) with the options Leave Dungeon & Run Away or Next Room or Enter another Door (on the first turn). 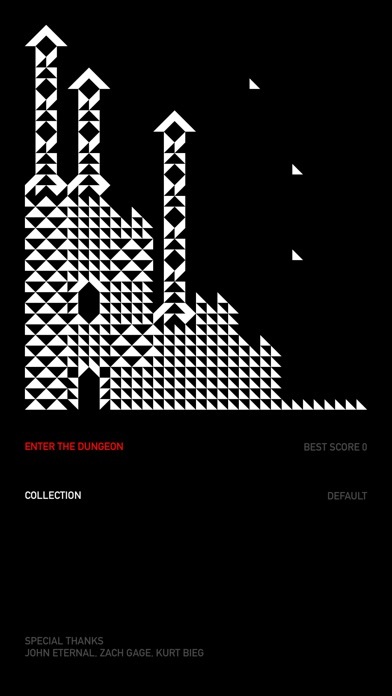 If you leave the dungeon you just go back to the "enter dungeon" title screen. I don't see any score/etc. If you die you are told what percentage of the dungeon you cleared and what room you were in. After all monsters are cleared, the run away option appears. Shields break after taking a number of hits proportionate to their strength - not sure if this resets from room to room yet. Equiping a shield when you already have one changes to that new value in AP. You cannot use two potions in a row, or you'll feel sick. That's it for initial impressions - if I have any major findings I'll be back! Monster level higher than shield: extra damage goes to you, shield gets a (#) of the total attack. Monster level same/lower than shield: Shield loses AP down to the point value of the monster. You lose HP equal to the monster value over the original shield value.If you attack an equal or stronger monster the shield will break and you'll take all the damage.) Try to take out stronger monsters first! Also: I'm not so sure about monster strenghts. Had a 23 point boss, and 2's seem to be a lot stronger than 2. Drinking potions and attacking a larger monster carry from room to room. 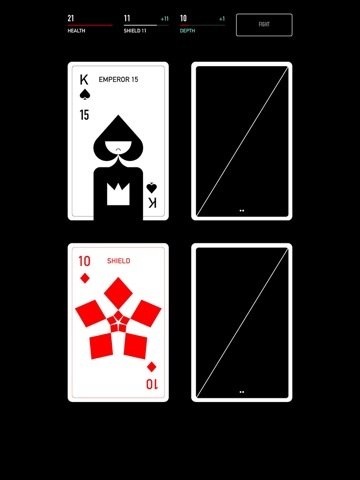 Monster Aces are 17, Kings are 15, Queens are 13. 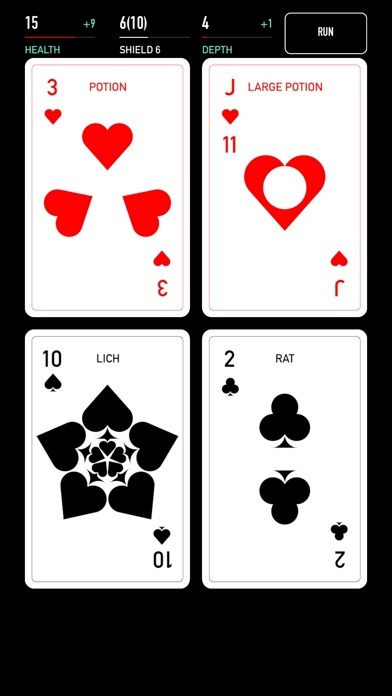 All other face cards and Aces are 11. When your shield breaks, you take the full damage of the monster. Played correctly (and with cooperating card draws) one shield can absorb a lot of damage! You can only 'run away' once per room. You get 1 XP for each card tapped on, even if it kills you. Let me know if I'm getting annoying and/or need to enclose this stuff in spoiler tags. This guy's games are really amazing. 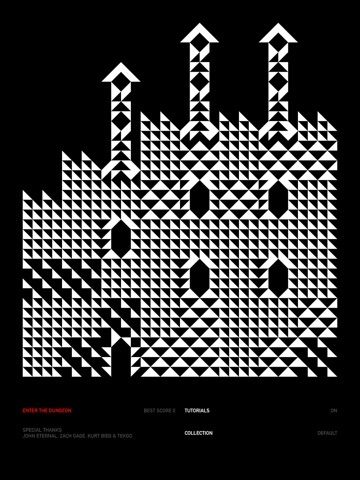 Hiversaires and Oquonie both taught the rules of their universes in a wordless, virtuoso meta-puzzle. I did not need to purchase any more games this week, but this is just too intriguing to resist! Thanks for these explanations, they're very helpful. This guy's games are quite abstract. I didn't have much luck with Hiversaries as much as I liked it. This looks right up my alley. But I'm out of credit for a few days thanks to Wednesday's as usual. I'll have to add it to my list! I'm curious how this compares to games like Card Crawl. Seems like a similar concept, but it's so simple and spare looking in comparison, I think I'll wait for more impressions. When you 'run away' the cards you run from go to the end of the deck in order, i.e. when you draw cards #55 and #56, they and future cards will be the ones you ran away from. Therefore, unless you draw very well, you need to run away from shields and potions when you can. That being said, sometimes you can get completely hosed with the redraw (that you can't run away from) but if you card-count, you'll have a good idea what to expect room 11/12 onward. I'm still not sure what the rhyme/reason is to when the game lets you run away mid-room. Seems sometimes it makes you waste shields/potions, sometimes not. 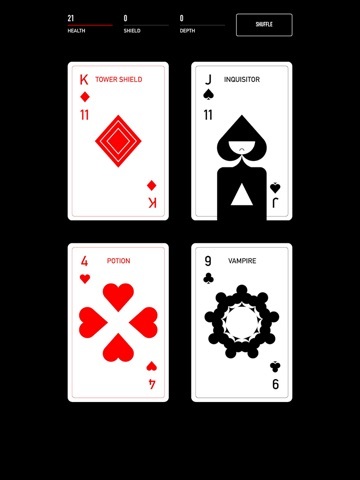 ...aaaand to compare again to Card Crawl - here is a game with similar design, using strictly a regular deck of cards (Monster: Boss = 21, Ace = 17, King = 15, Queen = 13, Jack = 11) and the big difference is how shields work: if you play a monster higher than the shield, you'll take the difference in damage. From there, a card equal to or higher than the last monster played breaks the shield and you take full damage! Monsters less than the last monster played you only take the difference between the shield and the monster's strength (if the monster is higher.) Thus an 11 shield could block damage from a 10, 8, 5 and 2 monster before breaking if the cards draw right. Any more questions, feel free to ask. It's a neat little game, and while I think I've got it mostly figured out, I'm still testing. It's a lot more difficult than Card Crawl (I haven't "won" yet) but different enough to warrant the purchase IMHO. 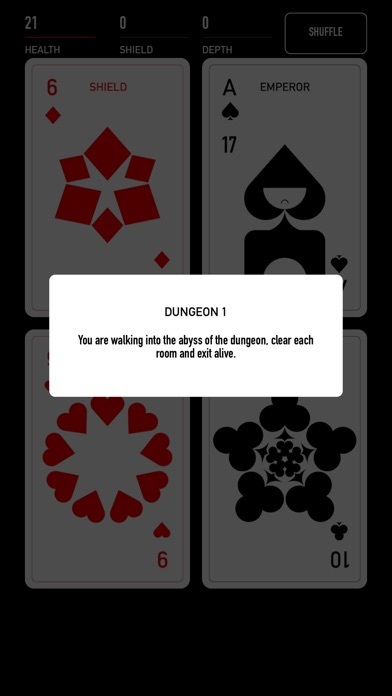 If you're really not sure, I'd probably recommend Card Crawl to people first though. Dungeon 2 gives you one more max HP (but doesn't set your HP to 22) and increases all the monster cards (except the boss) by 1. So, one plus Donsol has over Card Crawl is that if you play well, the game does get harder. People have found CC a little easy after the update and Donsol could provide that challenge. Thanks for the impressions and info, drelbs! There has been a major update to Donsol, cards are now named, the interface has been cleaned up, high-scores are kept, and the game even draws a nifty proceedurally-generated castle on the title screen for ya. Times that you can 'run away' are better detailed as well. It's all good, though I kinda miss the original card art. The new art does make things much more immediately visible though. Goes it track any stats like best runs? UPDATE: I now see that it tracks one's top score (cool) but that it doesn't actually save this result once you exit the game (WEAK!). Didn't notice this, bit of a bummer. In a nutshell - you're trying to get as far as you can while staying alive. You can run away once per draw (unless you just ran away) or when you're down to one card of the four. Clubs and Spades are monsters that hurt you for their point value. Jokers are Donsol / Boss Monsters that hit you for 21 points. Hearts heal you for the points listed. If you drink 2 in a row (even across rooms) you feel sick and don't get the benefits of the 2nd (3rd/4th/etc.) in a row. You must use shields effectively to do well in this game. Donsol (21 points) boss mosnter, you take 21-11=10 points of damage. K (15 points) monster, you take 15-11=4 points of damage. J (11 point) monster, you take 11-11=0 NO damage. 10 monster, you take NO damage, but shield is now a 10. 7 monster, you take NO damage, but shield is now a 7. 4 monster, you take NO damage, shield is now a 4. 8 monster - 8>=4 so your shield breaks and you take 8 damage. That single K shield blocked 11+11+11+10+7+4 = 54 points of damage! You will do much better in the first dungeon if you mash that Next Door option until you have both a large shield and some big monsters to use it against. You are also playing against a standard deck of cards, so if you pay attention to what you have defeated and what you ran away from you can get a better idea of what is ahead of you.